Chat, Post pictures and videos of your cars and/or shows you've been to. Note: No technical questions, for sale or wanted ads. Use the Classified section. Do not be abusive in replies. If you don't like the car - by all means say so, just think carefully about your response. Is it likely to cause offence? Would you say it to the owner's face? If there's any doubt, don't post. Outright abuse will earn you a warning at the very least. When posting pictures, accept that not everyone's going to respond in a positive manner. There's a big difference between being defensive and agressive in your replies. Do not take it as a personal insult just because someone does not like your car. Everyone is entitled to their own opinion, so arguing with people on the picture threads is pointless. Such threads are likely to be deleted and rewarded with a warning. If you have an issue with something that someone's posted on your thread, use the 'Report post to moderator' button. Don't start arguing. Above all, use your common sense. Please only post pictures and videos YOU'VE taken of YOUR car or shows YOU'VE been to!! The Polo - Another look for 2011! 6n2 Polo - My Paddy! Uni Project- Electric Turbo LOL! 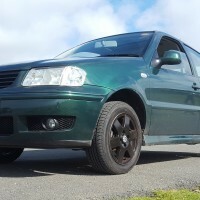 my first car... polo 6n2!